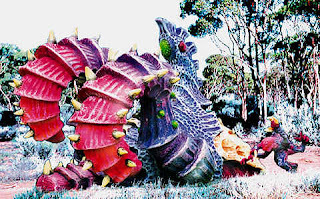 In honour of 40k's 25th Birthday this year, I'm working at an ongoing series called "The Tyranid Archive," which is meant to be a historical look back on where Tyranids came from and how far they've come. Here's our next, rather large installment. Note: this post has been edited thanks to some feedback from Tim DuPertuis himself. Thanks Tim! Back in Second Edition 40K days, a couple of companies started dreaming big dreams out in the western United States. 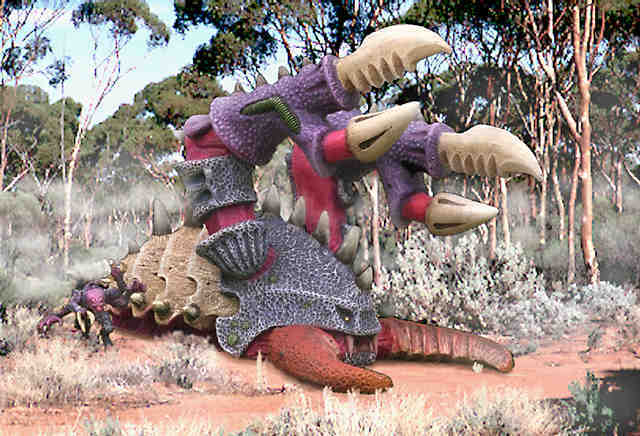 They took the designs of the miniaturized super heavy tanks and titans of Epic and made the creative leap of introducing these massive weapons to games of Warhammer 40K...at a scale that was more or less accurate. Their creations dwarfed the models that 28mm wargammers had become accustomed to, and the company that seemed to be selling the majority of these huge engines of destruction was called Armorcast. Armorcast started in June of 1995 as the brainchild of Tim DuPertuis and Dave Garton. 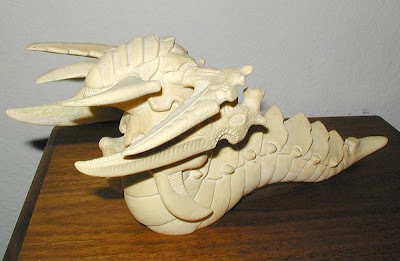 They allied their finances and technical skills in the realms of sculpting and mold making with the artist Mike Biasi. Biasi already produced a number of Epic-inspired sculpts through his company, Mike Biasi Studios, creating and replicating large-scale Warhammer 40,000 models of the type we see from Forgeworld today. A fact that may have been forgotten somewhere in the sands of time is that all of these companies who were producing 40k-scale replicas of Epic pieces were actually licensed to do so by Games Workshop. Individuals like Tim and Mike had approached Games Workshop, showing their work and asking for permission to make some massive models from GW's IP. 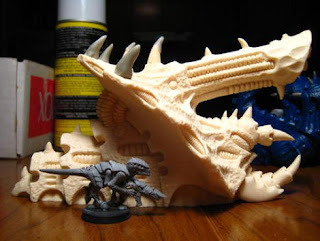 The hilarious bit is that GW never thought there'd be that much demand for such massive, expensive models, so, impressed by Biasi's work, they were happy to grant the licenses. Jump to a few years later when demand for large scale models has been created out of a vacuum by the hard work of companies like Mike Biasi Studios and Armorcast, and Games Workshop decides they might like to get into the game as well. The licenses are ended, the third party companies are asked to destroy their moulds, and shortly thereafter a GW subsidiary by the name of Forgeworld is born. 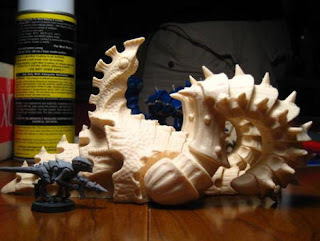 To their credit, GW's Forgeword did all of their own work and never recast any of the moulds that the other companies had created. 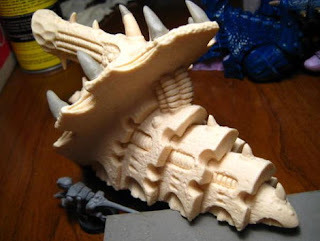 What's more, the models that started coming out of Games Workshop through Forgeworld were far more detailed than anything Armorcast had ever produced (perhaps with the exception of the Armorcast Superdetailed Baneblade. They were then, as they still are today, amazing. Still, we as modelers owe a lot to Mike Biasi and Tim DuPertuis and the others who decided to dream bigger. 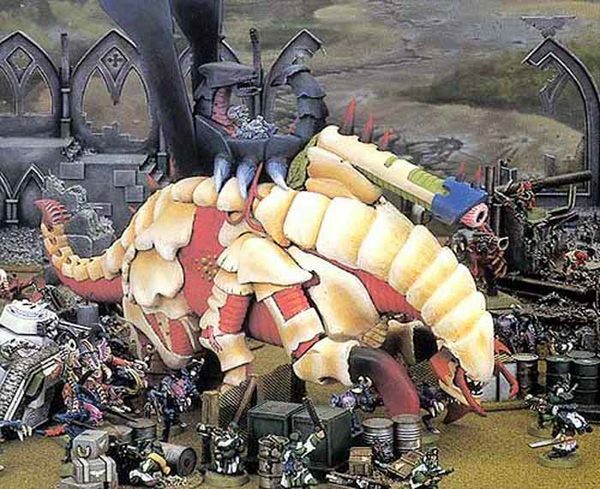 Were it not for these companies blazing trails early on in the realm of massive models, I don't believe that the Games Workshop incarnation of Forgeworld would have been as quick to get off the ground, and--who knows--perhaps, without Armorcast, Games Workshop would have never conceived of going big at all. It could be these pioneers that we all have to thank for Forgeworld Titans with zillions of parts and super-heavy plastics like the Baneblade. Though Armorcast put out a number of tanks and titans for all the races, the Tyranids were not forgotten. 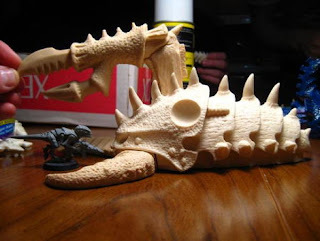 As this Tyranid Archive series is meant to focus on the history of Tyranid models, what follows will be a tour of the large scale Tyranids that were created during the Biasi/Armorcast era of Warhammer 40K. 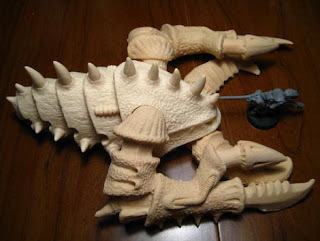 What follows are the original images of the painted Tyranid models that Tim DuPertuis over at Armorcast took himself. 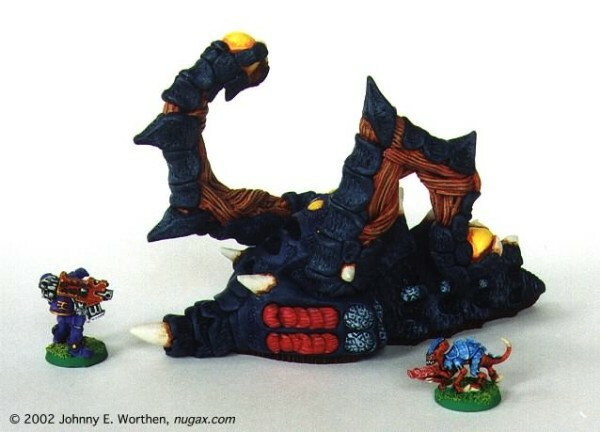 I still remember drooling over these things on the old Armorcast site, wishing that I had the exorbitantly large sum of something like $69 US to get an Exocrine of my own (not sure where I got that number; I've since been informed that the kits were priced as follows: Exocrine was $28, Malefactor was $33 and the Haruspex was $35). I remember pining away, imagining the looks that would cross my gaming buddy's faces when I plunked down one of these bad boys to go toe-to-toe with all of their annoying space marine tanks. I'm not sure where I thought I was going to find rules for them (I believe they may have been published in the old Inquisitor magazine that GW put out for Specialist Games), but that didn't seem to matter. I can remember clearly that all that mattered in my mind was having the model; that everything else would fall into place so long as I had the model. 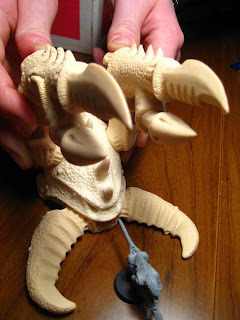 The late Accommodator/Ross Nickle had a complete collection of the Armorcast bugs, so he let me take a brief photographic tour of them before he had started painting them. 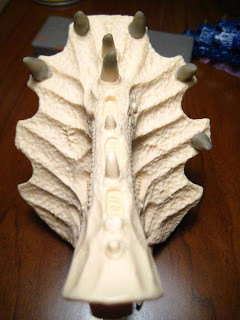 Hopefully these photos give a decent idea of what a pristine Exocrine, Haruspex, and Malefactor should look like (well, pristine with the exception of the spikes he'd started apoxie sculpting onto the Exocrine's armoured ridge). 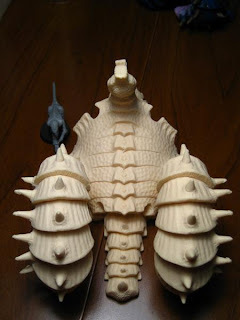 ..though I've heard it told that far fewer of these were produced than the Armorcast ones. When it comes to who created it and where it is currently residing, I have no information, and I'd love it if anyone was be able to shine a little light on the creature's fate. I have gained several of each of these Armorcast pcs. for Tyranid army. My question is what are they worth unpainted and how do I find the stats /codex to play them? If you want to know how much money they're worth, I'd say check ebay. As for rules, the most recent codex has entries for the Exocrine and Haruspex. I'd say you could field the dactylis as another exocrine, and I'm not sure what to suggest about the malefactor. Maybe a Tervigon? 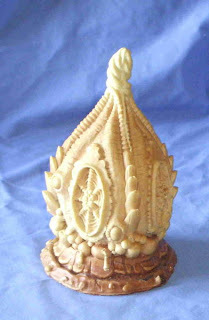 This is the hobby blog of Mr Pink, with the occassional interruption by his brother, Nuffsed. 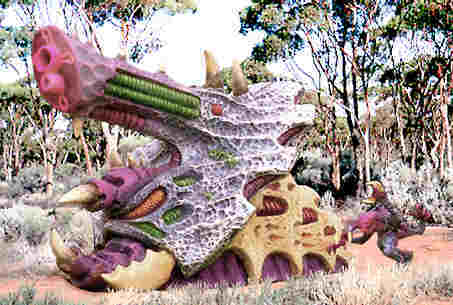 We create conversions of Games Workshop models (mostly) for Tyranids, Dark Eldar, Tau and Blood Angels (again, mostly). 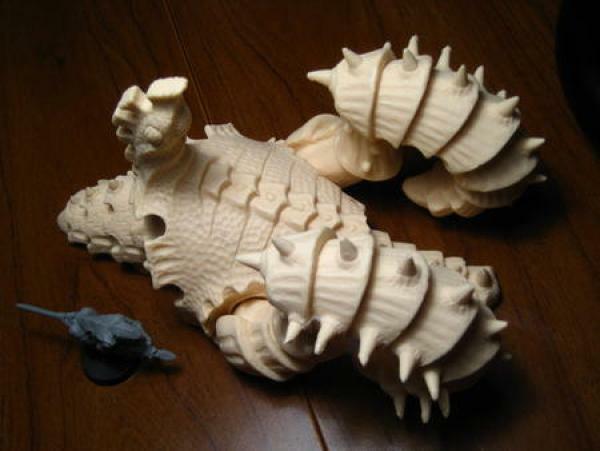 Mr Pink also offers tutorials on how to sculpt miniatures. Behold! 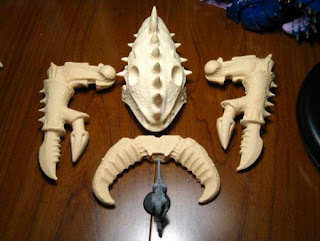 Monstrous New Nid Plastics! Hive Fleet Moloch, in all its glory. 40k, Adeptus Astartes, Battlefleet Gothic, Black Flame, Black Library, the Black Library logo, BL Publishing, Blood Angels, Bloodquest, Blood Bowl, the Blood Bowl logo, The Blood Bowl Spike Device, Cadian, Catachan, Chaos, the Chaos device, the Chaos logo, Citadel, Citadel Device, Cityfight, City of the Damned, Codex, Daemonhunters, Dark Angels, Darkblade, Dark Eldar, Dark Future, Dawn of War, the Double-Headed/Imperial Eagle device, 'Eavy Metal, Eldar, Eldar symbol devices, Epic, Eye of Terror, Fanatic, the Fanatic logo, the Fanatic II logo, Fire Warrior, the Fire Warrior logo, Forge World, Games Workshop, Games Workshop logo, Genestealer, Golden Demon, Gorkamorka, Great Unclean One, GW, GWI, the GWI logo, the Hammer of Sigmar logo, Horned Rat logo, Inferno, Inquisitor, the Inquisitor logo, the Inquisitor device, Inquisitor:Conspiracies, Keeper of Secrets, Khemri, Khorne, the Khorne device, Kroot, Lord of Change, Marauder, Mordheim, the Mordheim logo, Necromunda, Necromunda stencil logo, Necromunda Plate logo, Necron, Nurgle, the Nurgle device, Ork, Ork skull devices, Sisters of Battle, Skaven, the Skaven symbol devices, Slaanesh, the Slaanesh device, Space Hulk, Talisman, Tau, the Tau caste designations, Tomb Kings, Trio of Warriors, Twin Tailed Comet Logo, Tyranid, Tyrannid, Tzeentch, the Tzeentch device, Ultramarines, Warhammer, Warhammer Historical, Warhammer Online, Warhammer 40k Device, Warhammer World logo, Warmaster, White Dwarf, the White Dwarf logo, and all associated marks, names, races, race insignia, characters, vehicles, locations, units, illustrations and images from the Blood Bowl game, the Warhammer world, the Talisaman world, and the Warhammer 40,000 universe are either ®, TM and/or © Games Workshop Ltd 2000-2005, variably registered in the UK and other countries around the world. Used without permission. No challenge to their status intended. All Rights Reserved to their respective owners. All content contained within this web site is copyrighted by Nicholas Jones, unless otherwise specified. All rights reserved. Content made available for public download is provided for your personal use only. It does not constitute permission to repost the content on another site. Content (information as well as graphics or any other kind of content) from or through this site is provided "as-is," "as available," and all warranties, express or implied, are disclaimed. The content may contain errors, problems or other limitations. We are not liable for any indirect, special, incidental, or consequential damages. All responsibility and liability for any damages caused by viruses contained within the electronic files of this site are disclaimed.